India vs Australia 1st Test, Adelaide: India captain Virat Kohli is the team's premier batsman and a lot of hopes will be pinned on him during the 1st Test against Australia. India vs Australia 1st Test, Adelaide: India captain Virat Kohli is the team’s premier batsman and a lot of hopes will be pinned on him during the 1st Test against Australia. 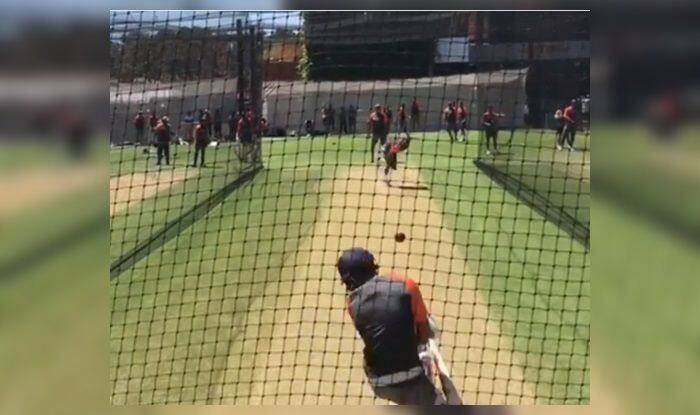 During India’s latest practice session at Adelaide ahead of the Test, Kohli was getting himself tested with the short ball as he is well aware of the fact that pitches in Australia will offer reasonable bounce. Mohammed Shami was bowling to him and a ferocious bouncer from the bowler was tackled with utmost ease as Kohli ducked beautifully, letting the ball past him. Meanwhile, Kohli has made it clear that he will not engage in any altercations. But Australians do not believe so as Mitchell Johnson and Pat Cummins have made it clear that that will not happen. Here is the Indian pace battery bowling in the nets to get in the right rhythm ahead of the 1st Test. It would be interesting to see who opens the batting for India, now that Prithvi Shaw has been ruled out of the Test due to a left ankle injury he picked up during the tour game.